David Miles | Paintings and Watercolour from the scottish Island Harris / Outer Hebrides - WATERCOLOUR GALLERY. 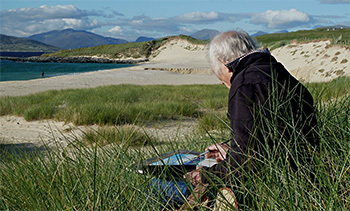 I find watercolour the ideal medium for painting out of doors in the Hebrides. The constant movement of the sea and sky and the ever changing light over the landmass I find can best be expressed through the moving use of watercolour. I have used watercolour in the Hebrides for many years and every painting is different even when of the same scene. Working directly in watercolour out in the open keeps me in touch directly with the pure natural forces of these Islands. It is ever a challenge. West Harris Sea and Light.